The author’s family lived near Mitcham Common. She describes daily life, school and special occasions, as well as wartime dangers and evacuation. never to recover to the same degree after it. the dance halls reigned supreme. Most towns and villages had regular dances in large or small halls. and late enough to serve the turnout of the dances or cinemas. went on to a new phase of life, finally leaving Mitcham forever except to visit my parents. Some of my mother’s photographs of the Seven Islands pond in its heyday, a favourite spot for both of us. and fields of other herbs producing oil extracts including peppermint. picturesque but most would disappear after the second World War. although no doubt supplemented by my parents. the records. I particularly remember my favourite by Maurice Chevalier – ‘Louise’. was kept for best and would often have a piano. 30s – probably more than a car. Trams ran across Mitcham Common from Croydon to Wimbledon and Tooting and beyond I suppose. Common and passed our house on the other side of the road. and asked for water, unlike today’s children who always seem to have a can of ‘coke’ in their hands. preserved in glass cases, probably some sort of ‘con’ – such as a two-headed animal. – hand-held sparklers in my case – but all good fun without any of today’s aggression. road, it wafted across all the time. They had, of course, lions, tigers, horses, monkeys and elephants. must have been an underground stream, as with all this use it never got stagnant or smelly. successful and interesting career, which he continued for the rest of his life. start of open country, now it comes into the category of South London. boathouse and boat-building business first started in 1912, which was the heyday of the river Thames. I recently drew this picture of the BIG LIZZY, from an old photograph I discovered in a book on fairs. A pair of giant swing boats, driven by a steam engine, it was my favourite and a popular feature of Mitcham Fair. we were allowed to go back to the farm. with the sole purpose of setting targets alight. ten seconds and wait for the explosion which might be very near you or perhaps further away. bomb Germany – an incredible sight that went on night after night. a nice reply from Ovaltine and a tin of Ovaltine sweets. tedious when you heard the same tunes repeated endlessly. sky one evening was one of the big airships, probably the R101 that crashed in France in October 1930.
a place full of sweeping staircases and mirrors. because we saw every Shirley Temple film – the child star who was my idol along with most young girls. has not. I think she was a year younger than me. the music was even louder – which suited me but probably not my mother. sight these days. The white arrow marks the house where I was born in Grove Road just over the Beehive bridge. at the touch of a switch. We still had no television, refrigerator or washing machine. sewing machine and if not, there were plenty of people who would do it for you at a reasonable charge. any change and receipt. Now gone forever but efficient in its way. career in teaching and usually very good. married before the end of the evacuation. state school and all the teachers seemed to be male. perhaps another year, we did start getting air raids and Mitcham in particular was very badly hit. obviously must have been a target, apart from the constant rain of shrapnel. rabbits in their hutch in the garden and our canary. My father in Home Guard uniform standing by our bombed Ford 8 in which he had just returned home. then an expert would have to get up to defuse them. wondered what happened to her. 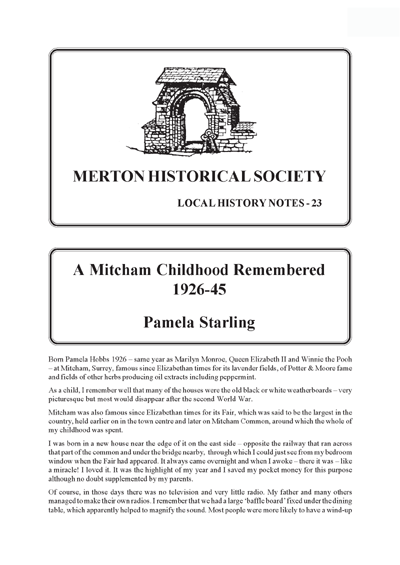 This entry was posted in Publications, Local History Notes, Publications and tagged in lhn, mitcham, modern mitcham, Reminiscences, urban mitcham, wartime.